Holiday makers in search of the perfect Greek island might well be convinced that they have found it in the Ionian island of Paxos. Paxos’s scenery is exceptionally beautiful and easy to explore by hire car. Paxos is also rather small, so it is perfectly possible to get around by bike or even on foot. The best way to explore Paxos, though, is by boat, and in Greece you can hire a 34cc motor boat without holding a licence (don’t try this at home). As Paxos is an Ionian island, the landscape is much greener than it is on islands of other Greek archipelagos. The vegetation is lush and abundant, and there are countless olive groves punctuated with cypress trees. In the summer Paxos is extremely popular with yachtsmen, and entire fleets of them arrive to anchor in one of the pretty harbours. There are three ‘proper’ towns on Paxos: Gaios, the capital and ferry port at the same time; Lakka, the second largest town in the north of the island, and Loggos, an enchanting little harbour town. Tourist accommodation is mainly to be found in the surroundings of the towns. Each town offers entertainment, with Gaios at the top of the list with the biggest range. The majority of the exceptionally beautiful beaches of Paxos and the small neighbouring island of Antipaxos are only accessible by boat. There are also a large number of pleasure boats taking holiday makers who fancy a swim in the clear turquoise water off the shore. All those who like small Greek islands and don’t care for noisy crowds will love it on Paxos. You get to Paxos via Corfu or Igoumenitsa on the Greek mainland. Gaios is the small capital of the Greek Island of Paxos. This is where the ferry port is situated with regular connections to Corfu and Igoumenitsa on the Greek mainland. As Paxos and above all Gaios are very popular with yachtsmen, there are numerous taverns, restaurants and bars there. Prices are reasonable, and the atmosphere is friendly and relaxed. Paxos has some nice beaches as well. 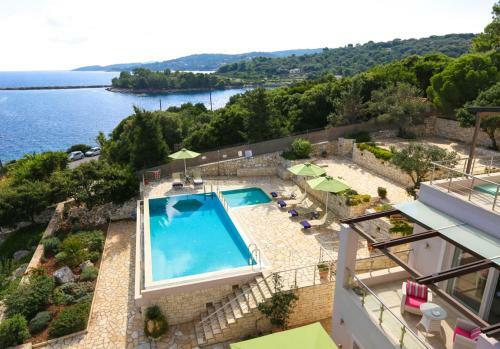 In the extreme north of the small Greek Island of Paxos the beautiful harbour resort of Lakka is to be found. Many sailing boats anchor in the sheltered bay, which makes a lovely picture. The harbour itself is crowded with colourful boats for hire – there is a large choice from pedal boats to luxurious motorboats. As the second biggest resort on Paxos, Lakka has quite a few bars and taverns, some located around the harbour, others in Lakka itself. There are some very atmospheric local restaurants as well. The bay of Lakka has two small and usually busy beaches, but there are some solitary beaches in less accessible parts of the island too. Loggos is the smallest out of the three villages on the Greek Island of Paxos. The pretty little harbour is lined by taverns and bars, and there is a whole fleet of hire boats bobbing in the water. In the surroundings of Loggos there are many holiday villas and small houses for hire; they are particularly popular with British holiday-makers. Relaxing evenings are best spent by taking a stroll through the small resort and sitting down for a drink at one of the bars on the jetty. Those who want a change of scenery can hire one of the island’s six taxis and go to one of the neighbouring resorts. Mongonisi isn’t really a proper resort as such, it consists of a few villas that were built around the beautiful little bay. Small fleets of visiting sailing boats like to anchor at one end of the sheltered bay and boost numbers at the small beach taverns. Mongonisi has one of the few sandy beaches on Paxos. As it is only 3 kilometres from Gaios, many people arrive by bike or scooter, or even by boat, as the journey only takes five minutes. For those who think that small is beautiful, Paxos is just right.